Yeah, this is number 800. 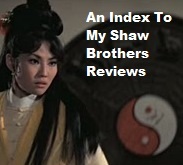 I deleted a few things recently -- those posts pleading for buyers for my Shaw Brothers titles, for instance -- and I cranked it up in May with the goal of hitting post number 800 while I was in Hong Kong. That was easy as I'm hitting it after my first night's dinner. Dinner was at Han Ah Rum in Causeway Bay. It was very good and more than enough food for us.